I thought I would talk about just what is blooming now in my USDA Zone 8 garden on June 2nd. Living in the Willamette Valley in Oregon is wonderful. It is one of the best growing areas in the United States. However this year, because of the rain and rather extended early spring weather conditions, things are blooming about two weeks late. We are starting to really get going now I will walk around my garden and show you some of the things that are blooming in my little video. Not yet blooming, but getting ready to are my peonies, baptisia, several other clematises, and red valerian. Some of the things that you can see are my irises. They are really starting to bloom now. My favorite is Edith Wolford, which is the blue and yellow one I have blooming right outside my front window. 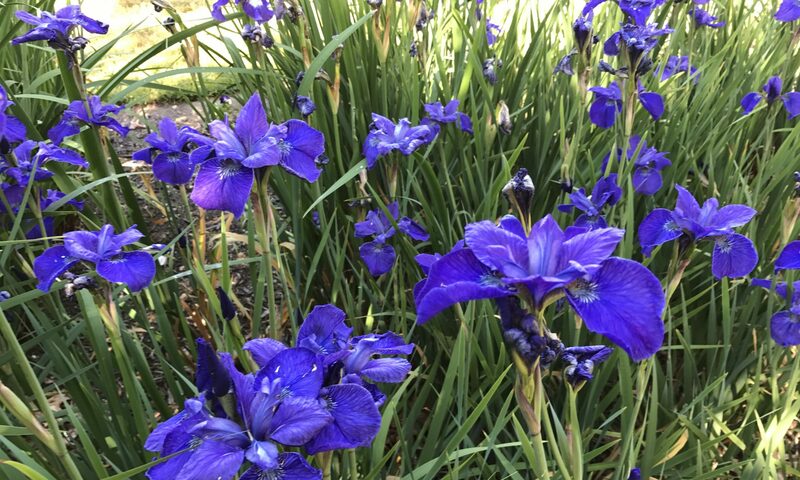 I am very happy to have a new pale blue Siberian iris blooming along with my dark blue one in the back yard. A yellow one will bloom soon. My dogwood is just about done blooming. The blooms are now fading, and are well past their prime. My columbine are also beginning to fade and are loosing petals. I hope they have continued to cross breed and give me new colors next year. All my rhododendrons and azaleas are in full swing I have some beautiful red rhododendrons, magenta and grape colored one. I also have some very pretty red azaleas that are rather past their prime and are starting to fade. However a pink double azalea is in full swing and is just gorgeous. My lupine is blooming, two of my clematises are blooming, the chives are blooming as are the foxglove and saxifrage. Just opened today are some of my poppies one that is a very pretty pink and another white with a maroon center. The one thing I find really interesting is the different microclimates in my garden. My front yard seems to get warmer and my irises started blooming there quite a bit before the ones in my backyard. The time difference seems to be about a week apart. Both areas seem to get about the same amount of sun, although the front yard may get slightly less than the back, and it is warmer. However I believe the real difference may be that the backyard is slightly downslope from the front yard and cooler air may be pocketing back there. On the other hand, the front is nearer the concrete street, which holds the heat; or a combination of both. It’s very interesting. If you would like to share what is blooming in your garden this first week of June, please leave a comment here and tell us what hardiness zone you live in and whether that is USDA, Sunset or some other system.